Observe this superb draftsman in action as she narrates her drawings of the model(s). This video promises to be a visual foil to her book on the same subject which will be published next year. Watch as she demonstrates the concepts of drawing and how they differ from the painter's viewpoint. The video contains many poses and quick sketches, as well as more refined drawings, all while you watch the artist in action. If you've never had the opportunity to attend one of Sherrie McGraw's workshops, this Drawing video, and the Painting video below, will give you a sense of the experience. Observe this superb draftsman and painter in action. 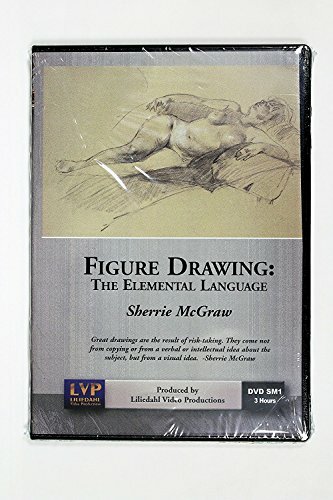 She explains the differences between drawing and painting through dozens of gesture drawings, a long drawing, and finally, in the second video set below (Painting the Figure), how to paint from the live model. Learn how to pose the model and how differently the lighting affects the drawing vs. the painting. Both these videos are a must-have for every serious student of figure painting. If you have any questions about this product by Liliedahl Video Productions, contact us by completing and submitting the form below. If you are looking for a specif part number, please include it with your message.